I am so super excited to be a part of Tikkido’s Trunk or Treat blog hop again this year! I love the fabulous ideas that my blogger friends come up with. Last year the whole concept of Trunk or Treats was very new to me. This year I’ve seen lots more and hope to see even more popping up at Halloween! If you are unfamiliar with Trunk or Treats, you are bound to see one soon. They have become more and more popular in the past several years, as church groups, schools, and other social organizations want to celebrate Halloween together in a safe, convenient way–even if the various members don’t live in the same neighborhood. So people gather in a large parking lot, and literally decorate the trunk of their cars. Kids then go trick-or-treating from car to car. Fun right? So, without further delay, welcome to our Trunk or Treat blog hop, hosted by the lovely Nikki of Tikkido. Just like last year, all hop participants were provided Halloween product by Oriental Trading Company. If you haven’t checked out their Halloween store before you simply HAVE to! I had an absolute blast shopping for my Bug Bistro Trunk or Treat. I found some fantastic display pieces, a black-rimmed geometric terrarium candle holders for my “candy worm farm”, champagne glasses, black acrylic ice, scorpion skeletons, BUGS and so much more! So friends, why don’t you come over for a bug cocktail and some scorpion soup?! To create my Trunk or Treat Bistro I used a piece of velvet fabric to line my entire trunk. Hanging it up to the ceiling using a couple of photo booth clips. This way you can’t see through to the main part of the car, so I keep the dark spooky look. Then I layered more Halloween fabric to give some gloomy texture. I also used this fabric like a bunting across the top of the car and down the sides. A couple of super large spiders held it in place. To extend out my trunk out, creating a “Bistro table” I added a small table in the front which was also layered with the same fabrics. Once the base fabrics were down I started adding my bug dishes! I have velvet lined jewelry trays left over from a previous party. On these, I added rows of bugs which I had spray painted gold. A quick and glam bistro assortment of tasty sweet treats. I raised these slightly with small picture stands. To display the “specials” of the day I used black frames with larger gold bugs pinned in the center of the frame. To get this look I took off the frame backs and covered them with velvet. Then I reattached the frames and pinned the bugs to the velvet. These were also displayed on frame stands. Next, I added my bistro signage, a letterboard from DCWV, their colored letters were perfect. My “bug candy” displays came next. A terrarium full of worms and my favorite a bug mix in clear skeleton heads from Sweets Indeed. The cocktail specials, in champagne glasses included bugs on top of black ice and eyeballs with a topping of spiders! 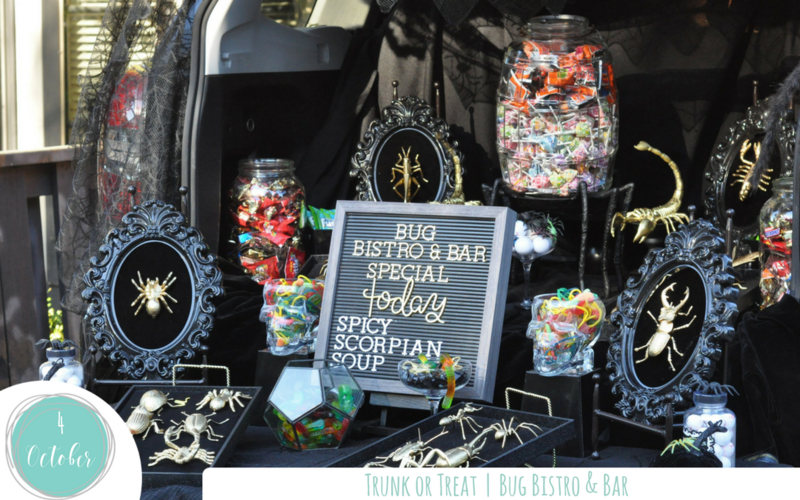 For the bulk of the candy I used large glass jars on each side of the trunk with some smaller black boxes of candy behind the bug displays. In addition I placed one large beverage dispenser full of candy in the middle on top of some creepy spider legs, a stand I’ve had in my Halloween stocks for a while and love to pull out! Lastly a couple more fun props. Large gold scorpions on top of black candlesticks. Jars of eyeball candies, black velvet pumpkins and as many bugs as I could find. My kids just loved this whole setup! I must admit I had a little fun with my son before the setup. I served him up “Bug Parfait” Indiana Jones Style before I got started. His reaction was priceless! Swipe for his classic response! I laughed out loud watching him and hope you enjoy the drama. Well, friends, I hope you enjoyed my Trunk or Treat Bug Bistro. Here are the links to more Trunk or Treat inspiration from my blogger friends. 4. Hocus Pocus Trunk or Treat by Pineapple Paper Co.
Have fun hopping through this years Halloween Trunk or Treat. Happy Spooking! So cute!! That bug bistro is the best idea!! What a fabulous idea! I love how it’s perfectly glam and gross at the same time. I’ll bet the kids LOVED it!